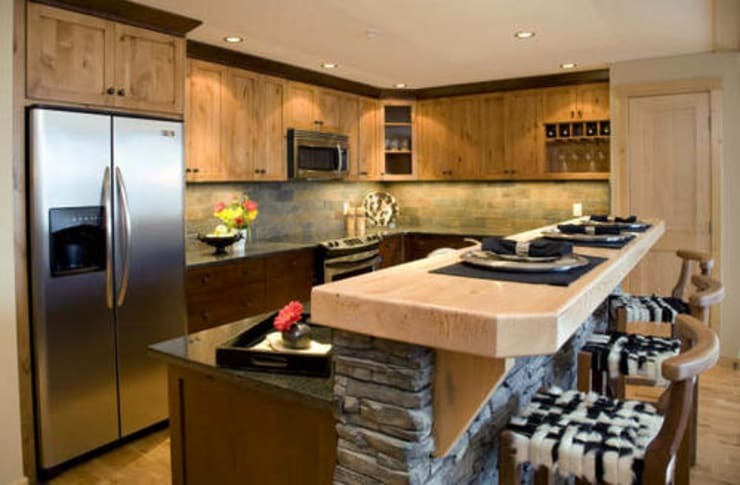 8 ways to use wood for your kitchen counter tops! When it comes to design and decor, homify has some of the best examples in the world! Today, we are going to apply those to the kitchen as we look at eight ways to use wood for the counter tops. Wood is a wonderful material for the kitchen both in terms of aesthetic beauty as well as functionality. In fact, as we explore the following designs you will see how wood is gaining popularity as more and more people opt for it in the kitchen. 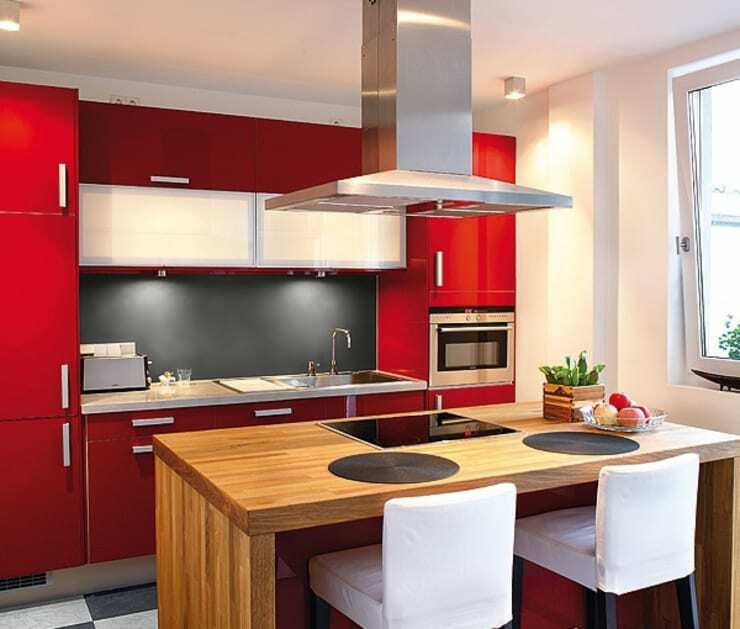 Not only does it give a spectacular touch to the whole environment but it makes for a very durable kitchen. Preparing food has never been so delightful. Shall we take a look at these incredible examples? Wood is not only a good idea for the top of the kitchen counters, but also for the kitchen bar that separates the cooking area from the rest of the living space. In interior architecture, mixing raw materials is always a wonderful idea. As we can see in this design, wood goes very well with stone. Natural materials work in harmony with one another and bring a sense of warmth to the kitchen. This design by professionals Zazurca Architects is very interesting and very economical. 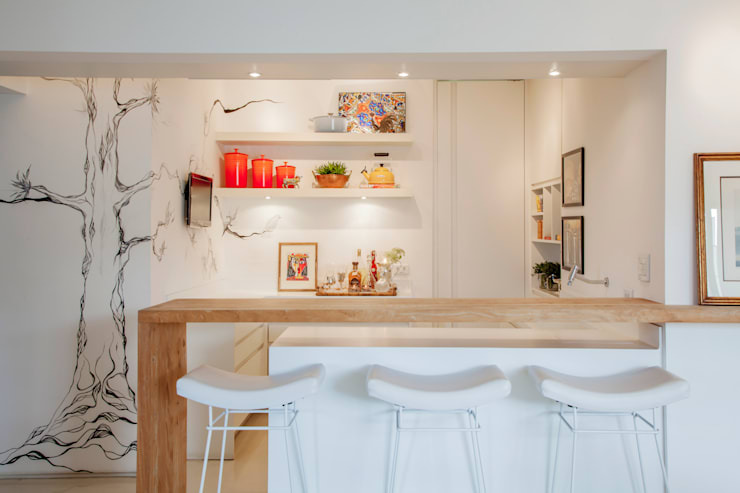 Instead of building a kitchen island that is separate from the built-in kitchen, these designers have created a wooden table that continues from the counter top to the bar. It's simple yet stunning! 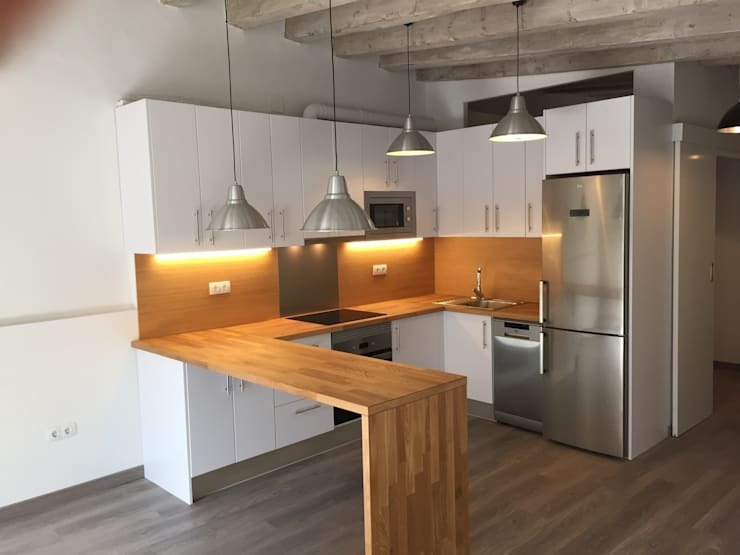 Wooden counters are often used today in modern kitchens as they bring a comfortable and warm ambiance to the cooking area. They are also very functional and beneficial. While many people opt for marble for their counter tops because of its high quality and durability, wood is simple, practical and subtle. It's also a great material for a breakfast bar, as we can see in this design. In this spacious kitchen, we can see how polished wood gives a unique and elegant finish to your kitchen space. Do you notice how it expands before our eyes? The colour is also very beautiful and works in harmony with the rest of the design and decor. It adds a lovely rustic touch to a contemporary look and feel. Wood is a must for those who value comfort and practicality! The kitchen sometimes requires a little bit more imagination than we bargained for, which can be hard when we are lacking ideas. This is why we recommend wood! Do you see how beautiful it looks in relation to the rest of the kitchen? It truly goes with any style or design. It's also a fun DIY project. Place a wooden plank along the wall and you have a cosy little kitchen bar nook that is spacious and easy to clean. Pair with some bar stools and you'll have the ultimate modern multi-functional cooking area. This is another example of how wood truly goes with any style or design. With a bit of imagination, innovation and creativity you can do wonders with this authentic resource. In this kitchen, we can see how wood has been used to create different levels of a table. This is very original, practical and functional. Tip: Go for this option in a small home where space is limited. Wood is very adaptable to demands and tastes. 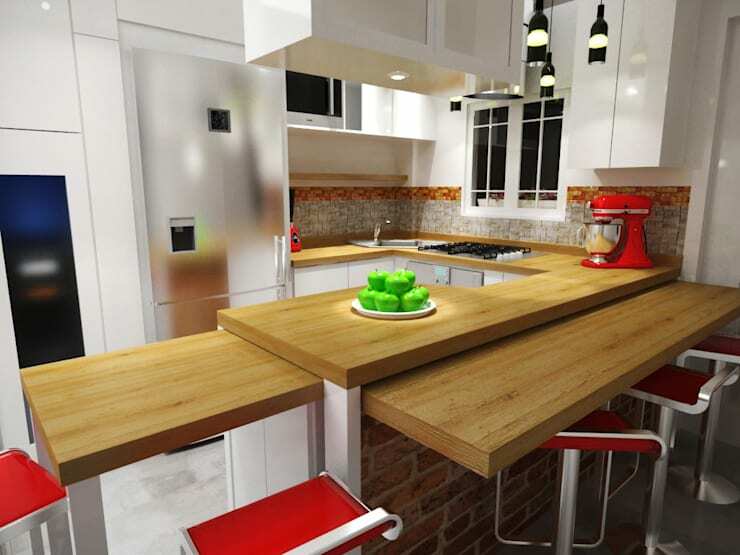 In this design, we can see how a single wooden element brings a refreshing touch to a trendy kitchen. 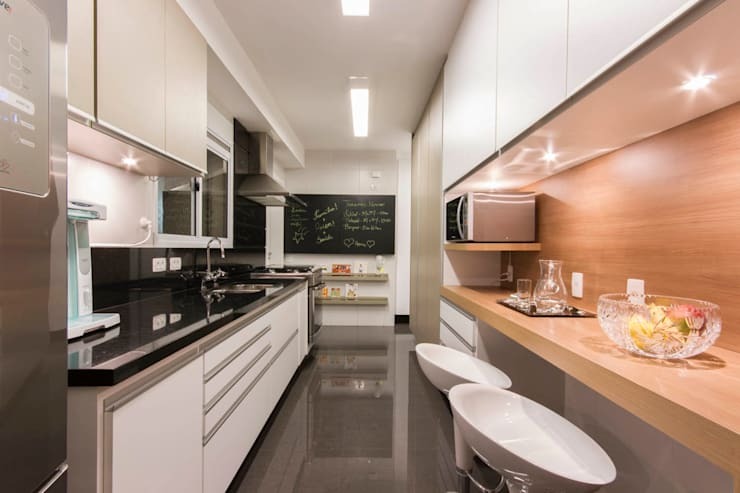 This is a very minimalist design that adapts to the requirements of the showy kitchen. It also softens the darker tones and adds a homely touch to the environment. Wood is one of the best surfaces to work on and is also very easy to clean. Maintaining it simply requires a damp or almost dry cloth. You don't want to get too much moisture on wood! We recommend adding a layer of varnish to the wood in your kitchen to insulate it. This will preserve it for many years to come! It will also keep it free from scratches, stains or marks. If you've enjoyed this article, you'll love this one too: How to integrate wooden elements into your home. Would you choose wood for your kitchen?